Gardens are most often designed to please the sense of sight. Others are designed to satisfy our senses of smell, taste and touch. These things are relatively easy to accomplish. All it takes is a fragrant Lilac with showy blooms, or an herb garden filled with Oregano, Thyme and Catmint. 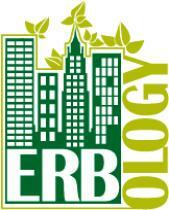 The more difficult, and often forgotten, sense we need to embrace in garden design is hearing. Sounds can invoke emotions just like color and texture. 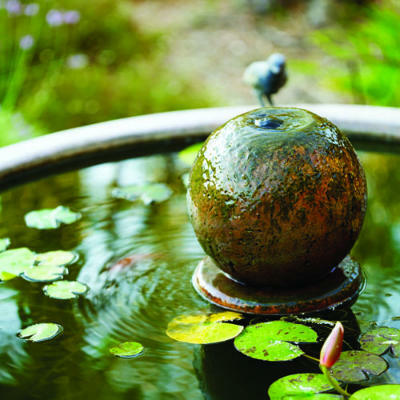 Water is a common element that can easily be added to a landscape setting and it can range from a formal fountain to a bubbling stream. A trickle of water evokes a more natural environment and can drown out unwanted noises in the medley of urban cacophony. 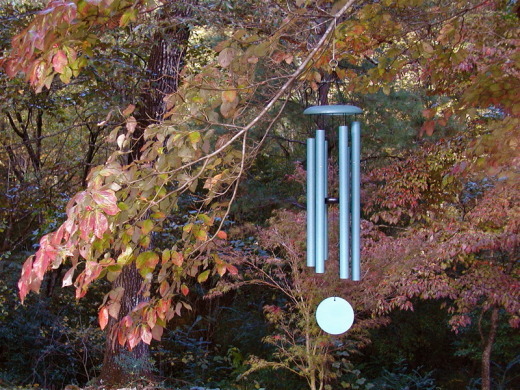 Wind chimes and garden bells range in materials from wood to metal to everything in between. They can be of visual interest or melt into the background being heard but not seen. Mostly dependent on wind or water movement to create sound, chimes and bells can be a gentle knocking of wood or a sharper tinny clang of metal. Even with a slight breeze, chimes provide a relaxing point of interest to a plain garden.